The objective of the Registered Mail Study Group is to collect, organize, and disseminate information related to all aspects of the U.S. registry system to include, but not be limited to, labels, stamps, markings, and regulations. 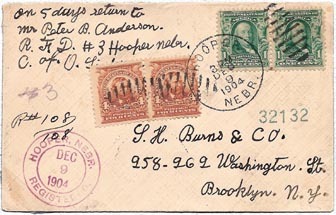 The Group has undertaken several projects, including a census database of known covers bearing registry exchange office lables, and a bibliography of literature related to all aspects of U.S. registered mail (see links below). The census is covered in two tables: 1) Census of all known covers bearing the registry exchange office labels in use from 1883 until 1911. 2) Summary of numbers of covers, by exchange office, including offices with no known labels reported. Due to shear volume, the census does not include labels issued by the New York Exchange Office. The information contained in this census is the basis for the Registry Exchange Label listing in the Scott Specialized Catalogue of United States Stamps and Covers.